April 14-2015 Last Wednesday, April 8th, 2015 voting ended on the Nationwide Competition for the BEST PET FRIENDLY CITY in the U.S., sponsored by Gopetfriendly.com. The contest used the same format the College NCAA Basketball Tournament uses with 64 cities being nominated. The match-ups were head to head , with single elimination, winner moves on style. The sponsor who nominated the winning City was eligible for various gifts and prizes. The competition , like the NCAA Tournament, lasted 2 weeks and was ferocious. Their pet friendly version of March Madness has every bit the excitement and suspense of any great competition, and this year was no exception. Last year, Port St. Joe was also in the finals but finished in second place , losing by just a handful of votes. One hundred cities were nominated by their loyal fans, and the readers votes determined the winner after seven rounds of head-to-head match ups. The State of Colorado had a very strong showing with four cities making the final 8. The surprise of this year’s tournament was the success of the small cities. Early in the tournament Jackson, Wyoming knocked out Chicago, and Golden, Colorado beat New York City! Small town upsets continued though out the competition, and it came down to Port St. Joe, Fl. vs Telluride, Co. Port St. Joe shot out of the gates Monday, April 6, with tip-off (voting) starting at 10:00 A.M. EST. They opened a 60%/ 40% of the vote lead and , really, never looked back maintaining their lead until the final whistle was blown at 10:00 PM EST on Wednesday, April 8th. It appears as though Port St. Joe was not about to settle for 2nd place this year, and was not to be denied the TITLE. Not bad for a City (?) of 3,406. That is impressive. Port St. Joe, Fl. is located in the Florida Panhandle. The major focus and history of the town, which was the State’s original Capitol, was centered on the paper mill owned and operated by the St. Joe Paper Company (symbol JOE) . Thus the origin of the City name. The mill was by far the largest (only) employer and the whole area smelled worse than Gary, IN. Not what you would call an “ideal” environment for a pet friendly beach destination! That all changed when the paper mill was torn down in the mid 1990’s and the gorgeous white sand beaches were discovered. If you were savvy enough to buy some beach front property before, or just after, the mill closed you could have made a fortune. Port St. Joe is located 1.5 hours East of Panama City and 2 hours southwest from Tallahassee in Gulf County, Fl. It is very remote and actually hard to get to. But well worth the effort. It is bordered by the Gulf of Mexico on the South, the Apalachicola River Basin on the East, the beautiful St. Joe Bay on the West and miles and miles of National Forest Timberland to the North. The closest Interstate highway is almost 1 hour away. Picture an up side down Pyramid , with the tip , or point being Port St. Joe. They call the area the “Forgotten Coast” and has also been referred to as the “Redneck Riviera”. (see below) I have yet to hear a plausible explanation when it was the “Discovered Coast”. Perhaps it was in the 19th century. St. Joseph was founded by a handful of settlers in 1835. Within three years its population soared to more than 12,000, making it the largest city in all of Florida. Florida’s Constitutional Convention met at St. Joseph instead of Tallahassee in 1838. The delegates drafted Florida’s first constitution there, clearing the way for the Territory to become the 27th state. For some reason, I don’t think there were very many ” tourists” looking for white sand beaches back then! With the paper mill closing in the late 90’s the real secret gem of Port St. Joe was “discovered”. It is the gateway to beautiful Cape San Blas and some of the most spectacular and best preserved beaches in Florida. This 17 mile long Peninsula is a Pristine natural setting. Half of Cape San Blas is composed of a beautiful State Park, as well. St. Joseph Peninsula State Park, named the best beach in America (2002) by Dr. Stephen P. Leatherman (a.k.a. Dr. Beach). Cape San Blas, located near Port St. Joe along the Florida Panhandle’s Emerald Coast, is truly a vacation paradise. Here, you’ll find miles of uncrowded, pristine, white sand beaches. Among the other attractions: Pet-friendly vacation rentals, fishing, kayaking and boating, family-owned restaurants serving fresh Florida seafood, and the famed Cape San Blas lighthouse. (Recently moved to downtown PSJ) It was only natural that this area attracted people and their “Pets”. PSJ quickly gained attention as a Pet Lovers Paradise, with miles of unspoiled sand and uncrowded beaches. 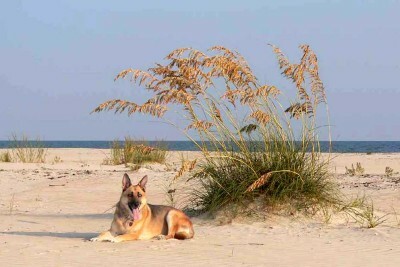 Many vacationers come to the area just because of its Pet Friendly reputation which has only grown with the gopetfriendly.com March Madness Competition. Especially after last year’s runner up finish, area folks put on the full court press to get the vote out. Many of the out of state vacationers that stay here year after year got exposed and motivated trough social media and there was even a chat room where people could post comments. That exposure and support certainly helped propel Port St. Joe to victory. Port St. Joe certainly appears very Pet Friendly. The booming vacation rental industry supports this theme with the vast majority of rentals promoted as Pet Friendly.